18 April 1911: Entered the Army as a Fahnenjunker in Füsilier-Regiment Prinz Heinrich von Preußen (1. Brandenburgisches) Nr.35, Brandenburg/Havel. October 1911-July 1912: Detached to the Glogau War School. 5 August 1914: In the field with Fusilier Regiment 35. 10 October 1914: Adjutant of the II. Battalion of Fusilier Regiment 35. 12 December 1914: Wounded/in hospital. 12 January 1915: Again, Adjutant of the II. Battalion of Fusilier Regiment 35. 1 March 1916: Deputy Regimental Adjutant of Fusilier Regiment 35. 19 March 1916: Adjutant of the II. Battalion of Fusilier Regiment 35. 31 August 1916: Wounded/in hospital. 20 October 1916: Allocated to the Replacement Battalion of Fusilier Regiment 35. 1 December 1916: Training as a Machinegun Company Leader with the 2nd Replacement Machinegun Company of the III Army Corps. 15 January 1917: Leader of the 2nd Machinegun Company of Infantry Regiment 451. 6 November 1917: Machinegun Officer on the Staff of the 234th Infantry Division. 14 February 1918: Returned to Infantry Regiment 451. 24 February 1918: Machinegun Officer on the Staff of Infantry Regiment 451. 1 March 1918: Deputy Battalion Leader in Infantry Regiment 451. 29 June 1918: Sick/in hospital. 22 July 1918: Returned to Infantry Regiment 451. 14 December 1918: Company Leader in the Replacement Battalion of Fusilier Regiment 35. 1 February 1919: Adjutant of the Brandenburg District Command. 23 October 1919: Transferred to the 3rd Machinegun Company of Reichswehr Infantry Regiment 5 of Reichswehr-Brigade 3. 25 October 1920: Adjutant of the Fusilier Battalion of Reichswehr Infantry Regiment 5 of Reichswehr-Brigade 3. 1 November 1920: Leader of the Transitory Battalion of Reichswehr Infantry Regiment 5 of Reichswehr-Brigade 3. 1 January 1921: Transferred to the 4th Machinegun Company of the 9th (Prussian) Infantry Regiment upon the formation of the new Reichsheer from the Übergangsheer or Transitional Army. 19 June 1922-7 July 1922: At the same time, Deputy Company Leader in the 9th (Prussian) Infantry Regiment. 1 October 1923: Transferred to the 9th (Prussian) Reiter [Mounted]-Regiment, Fürstenwalde, and detached to Wehrkreis [Military District] Command III. 1 October 1924: Returned to the 9th (Prussian) Infantry Regiment. 29 September 1925-23 December 1925: Detached for driving technical training with the 3rd (Prussian) Motorized Battalion. 1 February 1926: Hauptmann on the Staff of the 9th (Prussian) Infantry Regiment. 21 April 1926-6 May 1926: Detached for training with the 3rd (Prussian) Motorized Battalion. 28 June 1926-23 July 1926: Detached for training with the 3rd (Prussian) Motorized Battalion. 1 February 1927: Chief of the 4th Machinegun Company of the 9th (Prussian) Infantry Regiment. 26 September 1927-15 October 1927: Detached to a heavy machinegun course at Döberitz. 1 October 1929-21 December 1929: Detached for driving training with the 3rd (Prussian) Motorized Battalion. 6 January 1931-13 February 1931: Detached to the Tactical-Technical Officers Course at the Motorized Training Command, Berlin. 1 July 1933: Tactics Instructor at the Infantry School; renamed the Dresden War School on 1 January 1935. 1 January 1937: Commander of the III. Battalion of Infantry Regiment 33 (Motorized), Zerbst. 15 June 1943: Detached to Army Group D in France. December 1944: Underwent a head operation/in hospital. 17 January 1945-15 February 1945: Convalescent leave/in Leader Reserve. 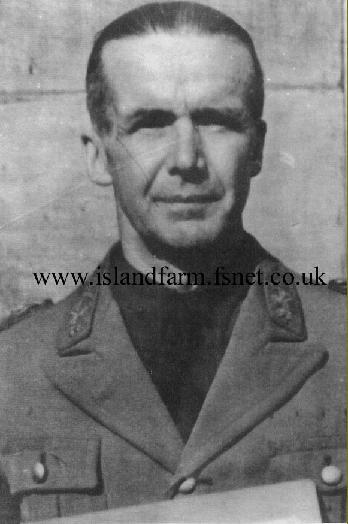 12th May 1948 transferred from Island Farm Special Camp 11 to Camp 186 for repatriation. Knight’s Cross of the Iron Cross: 2 October 1941, Oberst, Commander of the 13th Schützen-Brigade. Oakleaves (No. 110): 9 August 1942, Generalmajor, Commander of the 13th Panzer Division. Swords (No. 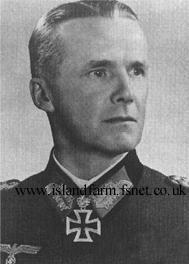 117): 18 December 1944, General der Panzertruppe, Commanding General of the LXXVI Panzer Corps. Prussian Royal Hohenzollern House Order, Knight’s Cross with Swords: 24 November 1917. Prussian Iron Cross 1st Class (1914): 21 October 1915. Prussian Iron Cross 2nd Class (1914): 14 September 1914. 1939 Bar to the Prussian Iron Cross 1st Class (1914): 12 May 1940. 1939 Bar to the Prussian Iron Cross 2nd Class (1914): 24 September 1939. Medal for the Winter Campaign in Russia 1941/1942 (“East Medal”): 3 August 1942. Mentioned in the Wehrmachtbericht [Armed Forces Communiqué]: 24 June 1944; 22 September 1944. Blumenson, Martin. Salerno to Cassino – The United States Army in World War II: The Mediterranean Theater of Operations. Washington D.C.: Center of Military History, United States Army, 1988. Bradley, Dermot; Hildebrand, Karl-Friedrich; Brockmann, Markus. Die Generale des Heeres, 1921-1945, Band 5 (v. Haack-Hitzfeld). Biblio Verlag, Osnabrück, Germany, 1999. Haupt, Werner. Army Group South: The Wehrmacht in Russia 1941-1945. Joseph G. Welsh, translator. Schiffer Publishing, Ltd., Atglen, Pennsylvania, 1998. On 25 October 1941, Panzer Group 1 was redesignated the 1st Panzer Army. Generaloberst von Kleist continued to lead the army until 22 November 1942 when General der Kavallerie Eberhard von Mackensen took command. Ordzhonikidze was renamed Vladikavkaz in 1990 and today is the capital of the North Ossetian Autonomous Republic in southern Russia. On 17 February 1945, General der Panzertruppe Joachim Lemelsen succeeded von Tippelskirch to command of the 14th Army, a post he held for the remainder of the war.